As it says in Wikipedia, "The red-eared slider (Trachemys scripta elegans) is a semiaquatic turtle belonging to the family Emydidae. It is a subspecies of the pond slider. It is the most popular pet turtle in the United States and also popular in the rest of the world. It is native only to the southern United States, but has become established in other places because of pet releases." What Wikipedia doesn't mention is that very, very occasionally this animal species will produce two-headed offspring. Both heads can often function and feed and these freak creatures can sometimes live to maturity. I am halfway through my time in Thailand. Time to take stock. The school remains a delightful place to work in. The children continue to smile, to work hard and to show me unquestioning respect. They are also very nice to each other. They always have pens and I have discovered that all have USB memory sticks or what they prefer to call "flash drives". Very handy. My timetable remains so light that I can easily get all of my work done during the school day. I never take anything home with me and have nothing to feel guilty about. Perhaps foolishly, I have taken on board the responsibility of promoting, editing and arranging the publication of a collection of students' poems. It was something that I felt I wanted to leave behind but it remains to be seen. Back at the Serene B&B in Ratchayothin, I feel like a member of an extended family. There's Staborn and Thida - the owners who are currently on holiday in Europe. There's their daughter Lisa who was born in New York City and can down a bottle of tequila in an evening... so she says. The lovely receptionists are called Leila and Bic. They live in cramped little quarters on the ground floor of the building. On Monday, I walked down to Kentucky Fried Chicken to get Leila some "chicken with bones". Bic always greets me with a handshake and a hefty pat on the upper arm. The youngest member of our family which also includes maids and nannies is Princess Serene herself - Lisa's three year old daughter who has just started pre-school. When ever she sees Uncle Yorkshire Pudding, she gets to me to draw her little cartoons. "Miaow!" means I have to draw a cat. 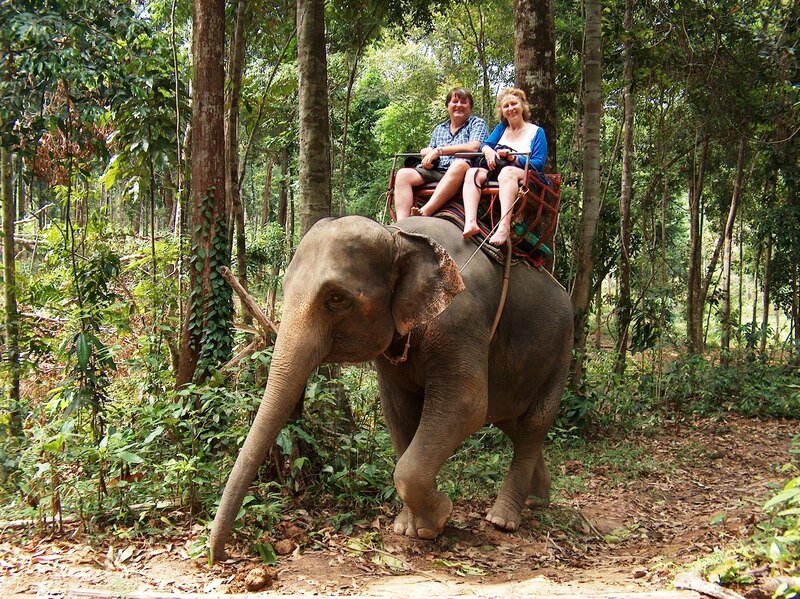 I have enjoyed trips to Koh Chang, Kanchanaburi and the Bridge on the River Kwai, Ayutthaya, Chiang Mai, Laos and most recently Kuala Lumpur. I have more ideas for trips. Two long weekends are coming up in May and after term ends at the end of June I want to spend a week somewhere very different before returning to England for Frances's graduation at the University of Birmingham. I have always loved to travel. To be somewhere different is ennervating. It makes me feel like a child locked in a sweet shop at night. What do I miss? Above all I miss Shirley and our life together in Sheffield. I miss seeing our son Ian regularly and I miss the local pub with its characters - Gibby, Janet and Roger, Murray, Irish Joe, Bert, Arthur, Ron and Margaret and yes, even the often obnoxious Leeds Mick. I miss lovely Tetley's bitter slaking my thirst. I have missed springtime and watching our garden grow again. I miss watching the mighty Tigers at the KC Stadium. I miss decent mugs of tea and I miss cooking things in our kitchen. Eating out can be such a chore. But it was only ever going to be for five months. The missing won't have chance to become desperate. I came for the adventure and I came for therapy. Those last years as a Head of English in England left me battle-scarred. Every day you had to steel yourself for what was to come. A hypocritical headteacher, piles of official A4 binders with action plans and small-print to trip you up, minutes, spreadsheets, crying women, assignments to level, league tables and then dozens of recalcitrant youngsters without pens or much understanding of what it means to be a student, no interest in the illumination and joy that learning can bring but plenty of interest in mobile phones and salacious gossip. It was hard, so hard but I am pleased to say that the Thai therapy I self-prescribed has helped to heal those old wounds. As I always thought - there is another way to be. 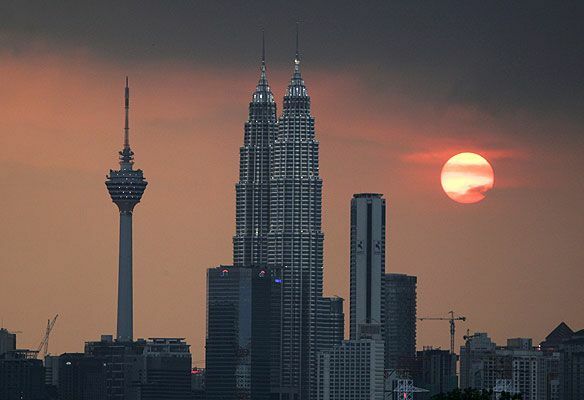 Some people spend their entire lives in Malaysia, never leaving it and there are probably people who have spent all of their lives in the country's capital - Kuala Lumpur - which means "muddy confluence". Me? I jetted in on Friday evening and jetted out on Sunday afternoon feeling rather frustrated that those forty four hours will very probably be the only hours I ever spend in Malaysia. The vast palm tree plantations on the way from the airport. Most Muslim Malaysian women wear the "tudung" or hijab headscarf. Why? I have no idea. There are many Indian, Sri Lankan , Bangladeshi and Pakistani immigrants living in Kuala Lumpur. English is very widely spoken and at a book sale in the middle of the Legends Mall, I noted that all books for sale were in English. Alcoholic beverages are not as widely available as they are in Thailand. In the Internet cafe I visited there were maybe a hundred computer stations and that evening everybody else in the room was playing computer games. There are many monkeys on the steps up to the Batu Caves on the northern edge of the city. The Batu Caves contain Hindu shrines. Kuala Lumpur has some good transport links including a monorail and excellent train and bus services. The Petronas Towers - once the tallest building in the world - look really lovely at night. 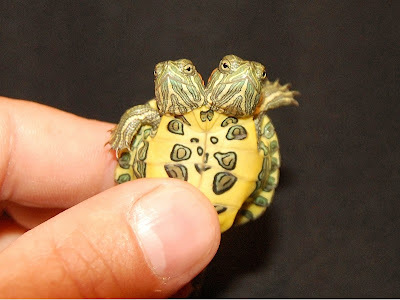 In the strange "Animal Kingdom" below KL Tower there was a two-headed red ear slider turtle and yes - it really did have two heads! Malaysians love English Premiership football as much as the Thais do. In marketplaces, Malaysians are more "pushy" than Thais - calling out and trying to win sales. Malaysian currency is called the ringit. Ten ringit is roughly £2 GBP. Malaysian people like to get up early. Kuala Lumpur seemed both peaceful and friendly - far less hectic than Bangkok can sometimes appear. Chicken Chowman is not a dish to order if you are hoping for a nice meat curry. But the main thing is that I successfully received a 30-day stamp in my passport when I returned to Bangkok. Hence, my work status can now be ironed out and I shall not be deported as an illegal alien. Readers of this humble blog will recall that recently I travelled into Laos. Before crossing the border, I presented my passport to a uniformed Thai official behind the little glass counter in Chiang Khong. I said, "Teacher in Bangkok. Need re-entry visa. Thirty days." He cancelled my B work visa and apparently didn't give me the required re-entry visa stamp. On my return from Laos I said the same things. My passport was stamped and I came back into Thailand believing that all was well with the world and in particular with my passport. Roll on to Monday of this week. I go to see the principal's secretary with my passport after noting that the B visa I was given in Hull was due to run out on Wednesday. On reflection what I think has happened is that the admin person in the school who looks after ex-pat teachers' passport and visa issues had neglected to request my passport and take it to the relevant government office for a more permanent work visa to be issued. That and the incompetence of one of the border officials has placed me in a very bizarre situation. I have to leave the country by air this weekend in order to get one of the precious thirty day stamps at an airport. By land I could, apparently, only get myself a fifteen day stamp. Why on earth the passport lady in school couldn't pull some strings and explain the predicament, I have no idea. But the Thais seem to love their bureaucracy, love signing forms in triplicate, love creating little administrative obstacles for people. 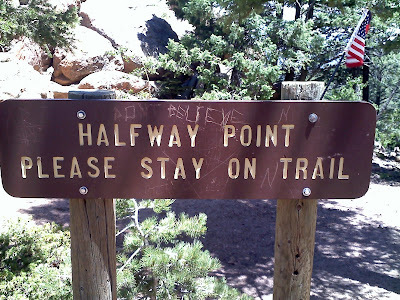 On Tuesday I checked - "Are you absolutely sure there is no way round this? I have to leave the country?" Over in Laos I spent under £60 in four days and that included hotels, transport, meals, bike hire, purchase of T-shirt, bottles of refreshing Beerlao, plasters for my foot, a large bunch of bananas and a bamboo flute. 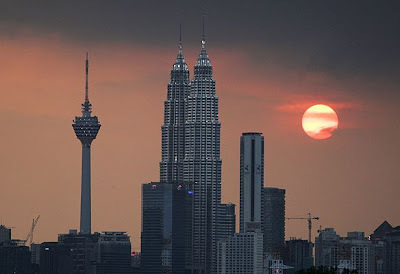 Tomorrow I have a return flight to Kuala Lumpur in Malaysia - cost £135. My hotel will cost me £20 a night. There will be meals to buy and transport tickets. Ah well, I'll get to see the Petronas Towers, hopefully track down a great Indian restaurant and briefly explore a city I never planned to visit. I guess there are worse problems to have. A common Thai expression is mai pen rai which essentially means - just go with the flow, bend like the bamboo and don't worry 'bout a thing. So Malaysia here I come with passport in hand. 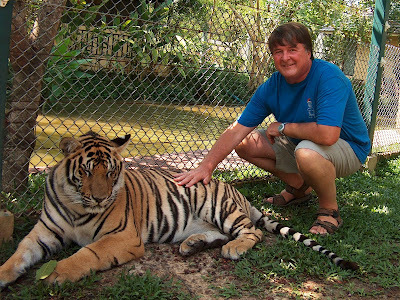 I hope that I am not boring you all too much with tales of my days in South East Asia. I am back at my lovely room in North Bangkok now after a ten hour bus ride down from Chiang Mai. This morning it seemed that everyone was returning to this vast city after spending family time in the provinces over the Songkran Festival period. The Mo Chit (Northern) bus station was chaotic at seven in the morning and I struggled to find a taxi driver who would bring me the short distance to Ratchayothin. Most were looking for bigger fares. I come back to Bangkok with many varied experiences, meetings and images to process. I never thought I would ever take a longtail boat across the Mekong River into Laos, never thought I would visit an opium museum in the Golden Triangle itself or meet women with unusually long necks in brass coils or go inside a tiger's cage or get soaked in water play as the colourful Songkran parade made its way slowly down the main thoroughfare in Chiang Mai's old town. I never felt lonesome but I wish Shirley had been there to share it with me. I guess I have always been quite happy with my own company but as the years go by, I have learnt to feel even more comfortable with the person I refer to as "me". Once there was an eleven year old boy riding into Hull after achieving a coveted eleven plus scholarship to Hymers College. That was lonesome. All my primary school friends from the village were travelling elsewhere that morning. Then at eighteen I was off to the other side of the world as a VSO volunteer on my remote Fijian island. It doesn't get much lonelier than that and looking back I will readily admit that I found myself travelling up a steep learning curve - a process that has stood me in good stead for solo travel through the rest of my adult years. You learn to be resilient, self-reliant and patient. I was in Laos for four days, mostly travelling with a lovely American lady called Audrey who also teaches in Bangkok. 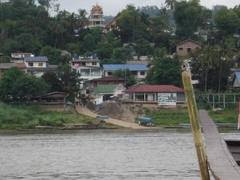 We met by the Mekong River after a longtail ferry had brought us across from Thailand. We found rooms in Huay Xai and the next day headed deep into the dark heart of South East Asia - a place called Luang Nam Tha. You could find it on a map if you were interested enough. There we hired bicycles and pedalled off into the countryside which was classically Laotian. A patchwork of tiny paddy fields, huts on stilts, blue mountains rising in the distance. We passed hill tribe villages where naked children played as pot bellied pigs and mother hens with large broods of squeaking chicks snuffled around in the verges and under the bamboo huts that the people lived in. This was not a place for tourist buses. The villagers bathed in the little streams that tumbled from the hills and they wove their own roofs from bamboo and palm leaves. Life is undoubtedly very tough for them and in parts of Laos there can be malnutrition and desperate need depending on the fluctuations of climate and farming. I know this because of my long conversation with a Laotian aid worker called Tao whom I met on my exceedingly cramped bus back to the Mekong. Lord knows how my joints survived. Tao wore Easyrider sunglasses and a khaki cap with a red star above the peak. His twenty nine year old heart was broken because his wife didn't want him any more. He was grateful for my counselling. So I am writing this now in the northern Thai city of Chiang Mai on the eve of the Buddhist New Year after a seven hour bus journey from the Mekong. Fortunately, that bus was spacious. Upon arrival, a Thai lady and her Malaysian boyfriend helped me to get a VIP bus ticket back to Bangkok on Saturday evening. All tickets for Friday had gone. Whilst I am up here I am thinking of signing up for a day course in basic Thai cookery. For four hundred years, up to its sacking by the Burmese in the late eighteenth century, Ayutthaya was the capital city of Siam. Early European visitors marvelled at its wealth, beauty and size. There were many temple complexes and palaces, thousands of statues of Buddha and everywhere there was lavish adornment in gold, ceramic mosaic and intricate plasterwork. Located in the middle of a rich agricultural floodplain, stone was not easily available so the architects of the old city used millions of bricks to achieve their structural ambitions. Shirley and I travelled to Ayutthaya by train. Each of our tickets cost us thirty pence. The old capital lies about fifty miles north of Bangkok. Upon arrival, I spotted a signpost for our hotel - across the railway tracks. Fifteen minutes later we were in the suburban oasis of Baan Thai House - run by sisters Bu-Nga and Leena Mayteedol. What a lovely hotel it was. Just twelve villas near a small lake and beyond that was a twenty metre swimming pool. The grounds were immaculately tropical. Every little thing seemed to have its place - to fit as if part of some harmonious plan. We stayed in Lake Villa 3 with its balcony overlooking the lake. The bedroom was spacious with a lovely hardwood block floor and all was tasteful and clean. On our only full day in the old city, we hired a tuk-tuk and driver till lunchtime. His name was Manop and he took us in his Barbie pink comedy vehicle to six of the main historical sites. We strolled around in the thick morning heat, marvelling at what once was. A huge number of statues of Buddha were headless and rarely could you get a sense of the exotic decoration that would have once adorned the city's multitudinous brickwork structures. Nonetheless it was a real wonder to behold and it spoke of ancient Siam's economic power, its self-belief and its all-consuming veneration of Buddha as the overseer of everyday life and hope for the future. 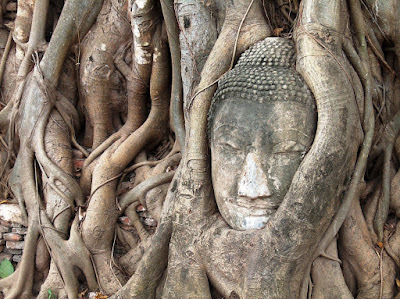 If Bangkok is home to the chilled out "zen dogs", Ayutthaya is where their nasty counterparts lurk. We were growled at, barked at and twice almost chased by semi-wild, hungry pooches with battle scars and a total incapacity for logical argument. They reminded me why I have always preferred cats. Shirley's flying home in the morning. I think I have given her a real taste of and for Thailand. We have got on so well together. It has been rather like the honeymoon we never had in 1981. After she has gone, I will fly up to Chiang Rai in the very north of the country for further exploration and probably a hop over the border into Laos. Once again my blogability will be reduced but I'll be back at this laptop on April 15th or 16th. I have never written this daft Italian word before - Ciao! 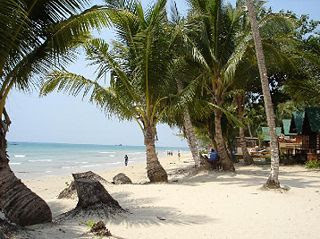 Above: The view from our idyllic little beach hut at White Sands, Koh Chang. 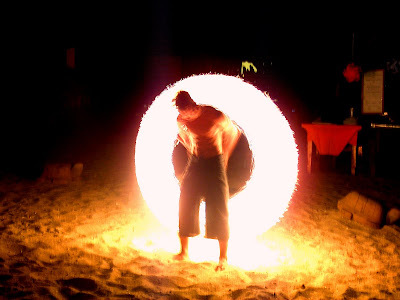 Bottom: Image of the "fire show" at White Sands.